Growing up in the Cambridge Fen with non-farming parents, driving combine harvesters during summer breaks from school, was the basis of Dr Christopher Green’s interest in agriculture. At the age of 16 he met Dr L.V.Vaidyanathan, an eminent soil scientist working at the time with the Agricultural Development and Advisory Service (ADAS). ‘Vaidy’ introduced Chris to the delights of agricultural research and data analysis and as a result he undertook a B.Sc. in Soil Science at the University of Leeds, graduating in 1980. This was followed by a Ph.D. entitled ‘Analysis of wheat growth in relation to husbandry and environment’ at the University of Nottingham, School of Agriculture, working with Professor John Ivins and Professor John Monteith, the eminent agricultural physicist who was pioneering the application of physics to biology. Between 1984 and 1987, Chris undertook post-Doctoral research work at the University of Nottingham, funded by the Ministry of Agriculture. Working in association with his old mentors Prof. Ivins and Dr. L.V. Vaidyanathan, and closely with Rothamsted Research Station, Chris published many peer-reviewed papers on a variety of topics from plant growth regulation of sugar beet to sowing dates and rates of cereals. These, together with numerous articles published in leading agricultural magazines, secured Chris’s name as a notable agricultural scientist, which later led to him being asked to act in the High Court as an expert witness on numerous occasions while still only in his twenties. During Chris’s time at Sutton Bonington he met two characters who would be instrumental in the establishment of his future career: Simon Packe-Drury-Lowe, a major landowner of a 2,500 acre estate at Prestwold Hall close to Sutton Bonington, who had a keen interest in soil management; and Ian Chalmers, an agronomist working for Ryehill Farm Service. These three individuals, together with Prof. Ivins, established Crop Management Information Limited. Sadly Prof. Ivins died of liver cancer shortly afterwards. Simon believed that there was an urgent need for an independent organisation with the scientific expertise to look at the raft of new products coming to market, and then educate groups of farmers in their value and use. He believed that farmers would pay for this training. Ian saw a young man who could apply well-researched evidence and fact to support his objectives in practical farm management. Over the year following its establishment, Chris recruited a small, scientifically trained team who would sift the vast amount of trials’ data generated each year globally (both published and unpublished), and condense this into training packages which were delivered to groups of farmers three times a year. To newcomers, these training sessions were challenging and exhausting: the amount of data and science that was covered in a day was considerable. But they could also be exhilarating because instead of being victims of well trained and well funded salesmen, for the first time they could be confident that they were making management decisions for sound reasons. After a few sessions, clients would find themselves educated in rigorously objective decision making; to distrust anecdote; to despise selective use of data; to respect statistically valid results from well designed trials and to reach for mechanistic understanding of the effect of each input. Many farmers commented that this approach rekindled their passion for their businesses and it not only made them more profitable and more resilient, but enabled them to manage their land with regard to the environment. Over time, the focus on products gave way to farming systems, and in particular Chris’s special interest in soil health, two decades before it became trendy. He was always amusingly challenging, and many present will never forget the effect on a group of rather bumptious East Anglian farmers, of his comment that many people nowadays had to apply for their own jobs, and how many of the present company would expect to survive in their present position if they had to undergo this process? Clients were generally prepared to forgive his horrendous taste in brightly coloured trousers. 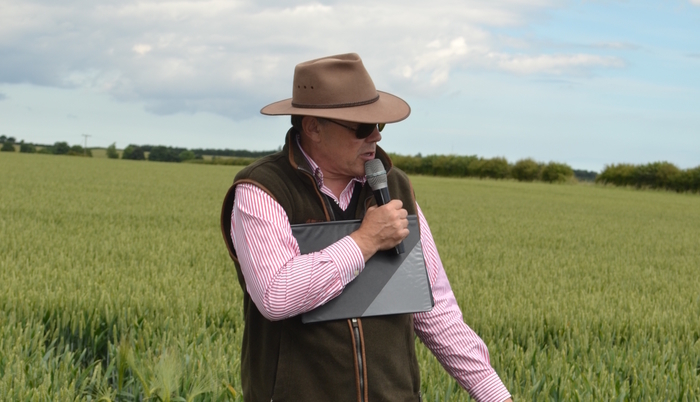 Other aspects of the business followed: his wife Debbie, who he met as an undergraduate student at Sutton Bonington, runs a small trials team based mainly at Cuxwold in North Lincs. Between them they have been successful securing funding to look at fundamental issues of agronomy in order to develop an understanding of principles of crop physiology, as well as commercial comparisons of different products. Those that had originally been part of the problem (distributors of fertilisers and pesticides) recognised the sense of his approach and also started sending their staff for training. His close proximity to farmers as well as his agronomic expertise made him valuable to manufacturers of farm inputs, and he was often employed to advise them. While he always regarded himself as a researcher and trainer, his company was recently consulting to companies in Eastern Europe that crop well over a million acres. Chris was deeply committed to his clients and considered it unethical to speak publicly or to publish information for which they had paid. While perhaps ethical, it was an attitude that made business development somewhat challenging and he remained generally unknown outside this circle of clients. However he was always swamped with work and his network and influence was immense: there are few who have influenced so many key people within the industry. Despite his distrust of Brexit, he died optimistic for the future of British farming. He said that the general standard of young people that he has trained recently is far higher than those of the early years, and that he was particularly impressed by the ability of the increasing numbers of young women now coming into the industry. Chris was always willing to allow his long serving staff to follow their enthusiasms both inside and outside the company, and exercised control with a very light rein. He never insisted that anyone else replicated his own prodigious capacity for work. Utterly intolerant of cant, he had no time for sloppy thinking. While he had an ability to understand issues and solve problems well beyond the norm, he combined this with kindness and patience to use this gift to help any who asked. Many of his clients became part of his wide circle of firm friends. Outside his work, he was a passionate and very competent field sportsman. He trained a variety of gundogs. He loved to fish. He was a jazz guitarist of note, and spent many happy weekends playing with his band around the country. He is succeeded his wife, Debbie, and by three daughters (Jenn, Hattie and Elspeth) of whom he was deeply proud. Born 1958, Dr Christopher F Green (son of Corinne and Peter Green) died on Sunday 27thJanuary 2019 in Lincoln Hospice of oesophageal cancer.